CASTALBUMS.ORG: REVIEW: Donnybrook! reissue featuring The Pete King Orchestra Plays the Music of Donnybrook! Originally published in Equity News. The grassroots #FairWageOnstage (#FWOS) movement scored a major victory in November 2016 when Equity signed a new agreement with the Off-Broadway League. We asked some of the leaders behind the campaign to share with us how a two-year process of organizing and advocacy resulted in this historic win. So much of Branden Jacobs-Jenkins’s latest is summed up in its name, War. The title simultaneously refers to a family at odds with each other, the aftereffects of a grandfather’s WWII military service, and a look at how what was (“war” in German) affects what is. 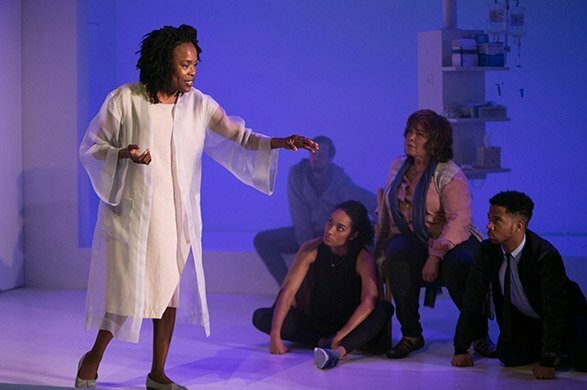 The family in question is anchored by Charlayne Woodard as Roberta, a mother felled by stroke, who speaks to the audience from within the cage of her mind as she tries to piece together who might need her to return to the world of the living. Who needs each other in a family is the bigger question of the play, as siblings (Chris Myers and Rachel Nicks) disagree about their mother’s treatment – and each others’ life choices. Michele Shay and Austin Durant’s appearance as strangers claiming to be hitherto-unheard-of family members in need should complicate the ethical discussion, but the play seems to take clear sides, going so far as to end with a long speech from the elder stranger (Shay) that shows everyone the errors of their ways and knits them into a happy family unit. The play suggests that “need” was never the right frame for asking these questions at all, and beyond need might lay a more potent framework for family. Strong performances (particularly from Woodard) and a touch of heightened theatricality help War rise above the average American family drama. Director Lileana Blain-Cruz beautifully balances the play’s realism and metatheatrics, drawing the audience into the play both literally and figuratively. Production photo by Erin Baiano. Pictured (l-r): Charlayne Woodard, Reggie Gowland, Rachel Nicks, Michele Shay, and Chris Myers. Paint Your Wagon is exactly the kind of show Encores does best. It was an early effort by one of Broadway’s most successful songwriting teams (Lerner & Loewe), working in an explicitly American idiom (gold-rush Americana). The show was a moderate success, but the cast album was severely truncated. The film bore little resemblance to the show, nor was it very good. So despite a couple of hit songs (“I Talk to the Trees” and “They Call the Wind Maria“), the show more or less faded into obscurity. Alfred Drake is having a moment. Sure, he died nearly a quarter-century ago, but with three of his albums newly available, it’s a great time to be an Alfred Drake fan – or to become one. Once Broadway’s leading baritone, Drake famously originated roles in Babes in Arms, Oklahoma!, Kismet, and Kiss Me, Kate, recording the latter two twice, with later stereo discs complementing the original monaural versions.